Christmas is just two weeks away, and if you’re like me, it feels like it’s beginning to “close” in on me!! I LOVE to do Christmas baking – cookies, pecan cakes, etc; however with all the last minute sewing and craft items left to make, I’m beginning to wonder if I’ll get everything done! 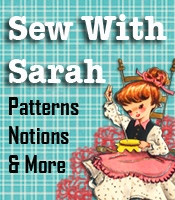 A few years ago my daughter put together a newsletter article for my SewWithSarah website regarding quick and easy ways to store cookies. I’ve dug out the information and want to give it to you here — perhaps that will help all of us retain some sanity this Christmas season AND get the sewing and baking done! Whether baking cookies for the Holidays, family reunions, or for bake sales, it is sometimes more convenient to “bake ahead” rather than feel the stress and pressure of trying to get it all done the day before the big event. We will give you a variety of ways you can get all your cookies made stress-free!! When cookies are stored, make sure soft cookies remain soft, crisp cookies keep crisp. The two types cannot be stored together! Store soft cookies in a container with a tight cover. Bar cookies may be stored right in the baking pan, tightly covered. Tuck in an apple wedge if they begin drying out. Crisp cookies should be stored in a container with a loose-fitting cover. If they soften – as they tend to do in humid weather, pop them in a pre-heated 300 degree over for five minutes before serving. Most cookies freeze well, either baked or unbaked, but freezing the dough is considered simpler and requires less freezer space. You can get more cookies “made” if you just make the cookie dough for several different kinds of cookies today and stick them in the freezer. You can then more easily bring out one batch at a time to bake while you’re doing other household chores. BAKED COOKIES: Bake as usual, cool quickly and freeze before packaging. Pack in frozen food containers, separating layers with a double thickness of freezer paper, overwrap the container;label and freeze. To serve, thaw cookies at room temperature 10 to 15 minutes. ROLLED COOKIE DOUGH: Roll out and cut the dough into shapes. Stack the cut-outs in cartons with a double thickness of freezer paper between the layers. Over-wrap the carton, label and freeze. Bake without thawing. UNROLLED COOKIE DOUGH: Form the dough into long rolls, wrap in freezer paper and freeze. Thaw just enough to be able to cut into thin slices. Bake on greased baking pan. DROP COOKIE DOUGH: Drop dough on baking sheet as if you were going to bake the cookies. Freeze the cookies on the sheet, then pack the frozen drops of dough in cartons with a double thickness of freezer paper between the layers. To bake, place the frozen drops on greased baking sheets and bake without thawing. BAR COOKIES: Freeze dough in baking pan. Go straight from the freezer to the oven, without thawing, and bake as usual. MOLDED OR PRESSED COOKIES: Freeze the dough in an airtight container after labeling. When ready to bake, thaw dough until it is soft enough to form the cookies. Denise is also author of the “Busy Person’s Cookbook”, which gives so many great quick and easy recipes for those of us who have so little time for cooking and baking. Whew, I feel better already, and am gonna get a start on the Christmas baking knowing that I WILL have time to do that and my sewing/crafting as well!